Here are some typical questions we get asked. 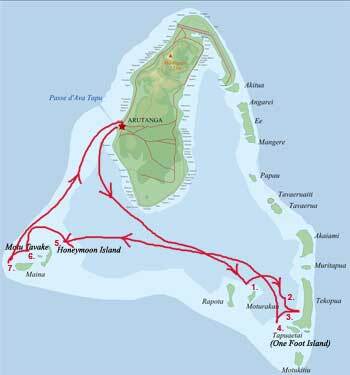 How do we get to Aitutaki? They have five flights per day Monday-Saturday and two on Sunday, from Rarotonga to Aitutaki to Rarotonga. The trip over takes forty-five minutes and is worth it for the view of the lagoon alone. If you are a great organiser you can book these flights yourself, and book accommodation yourself. Be aware of Time Zones! We are 3 hours behind Los Angeles (Pacific time) and 22 hours behind New Zealand time. You can end up arriving the day before you left if you are coming from Australia or New Zealand! We suggest you book your accommodation first and when it is organised you will know which days you will have available to cruise. You can then contact us to advise us by email or phone. Some hotels & agents will take care of this or book this for you. Some people wait til they arrive then decide which cruise to go on, but to avoid disappointment it is best to book with us in advance. Should we spend more time in Rarotonga and just do a few days in Aitutaki? This is entirely your preference, however there is plenty of accommodation on the island and most people are sorry they didnt spend more time. People don’t realise until arriving here, that there is so much to do to fulfil an exciting idyllic holiday, by getting out in the lagoon each day, snorkelling, diving, fishing, water sports, kite gliding or island exploring. Aitutaki is also a well known destination for Honeymooners or people who want to get married on Honeymoon Island. For a two island holiday you can contact the Wedding Planners, Rarotonga, to help organise this, they also have access to over 50 properties and can book your stay there, as well as organise your accommodation on Aitutaki, with our Kia Orana Cruise being the hightlight of the trip. What to bring on the cruise? Transfers (pick ups), snorkelling gear, drinks and lunch are included. If you have contacted Andrew to arrange the pickup, you can also ask any questions at that time. However you should bring: Bottle of water, swimming gear, aqua (reef) shoes, sunhat, sunglasses, sunblock, passport to stamp, (on One Foot Island) camera, and light clothes. Our lunches comprise of smoked fish and local fruit and vegetables. If you have any diet questions contact us. Our Seven Wonders Cruise operates 6 days a week. In each case, we always collect you in plenty of time, and drop you off to your hotel afterwards. We provide lunch on full day trips, and snorkelling gear. When you arrive please phone Andrew via his mobile to confirm your booking. Andrew Katu, is "Captain Fantastic" for the Kia Orana Cruise speedboat which goes out each day on the Aitutaki Lagoon. With more than18 years of operating experience he knows every inch of the lagoon, so you will be in safe hands. You can download this topographical map of Aitutaki here. When you arrive please phone Andrew to reconfirm your booking.